With the realization that checkbook quilting (paying someone else to quilt for you) can be quite expensive, I found the motivation to tie that fear up and give quilting a try. My goal this year is to inspire you with the thread I love to throw caution to the wind, lower those feed dogs and give quilting a try. Don't worry about perfection, focus on fun and knowing stitch by stitch you are accomplishing something. I started out solely quilting on my domestic machine (Viking Sapphire), then graduated two years ago to a mid-arm machine (Hani Quilter Sweet Sixteen). I am currently trying to hone in my skills as a long arm quilter on a Viking Mega Quilter 18 x 8. It is a very new and slow process to me and I look forward to sharing the process with you. It can be frustrating at times, but I know each stitch puts me closer to where I want to be. So this year, I hope to continue to inspire you to try and look beyond your piecing to discover the hidden treasures in your quilts that only thread can help you find. Not every quilt has to or needs to be quilted to death, but let's work together to bring all our quilts to life. Now I'm happy to say, piecing isn't necessarily my favorite part of the process...quilting is. I have been known to piece a quilt with the sole purpose of wanting to quilt it. I get excited when I can see a thread element I can add to an already great pattern to bring it to life and make it mine. I hope you can feel the excitement I have for quilting and that I can bottle some of it up and share it with you. 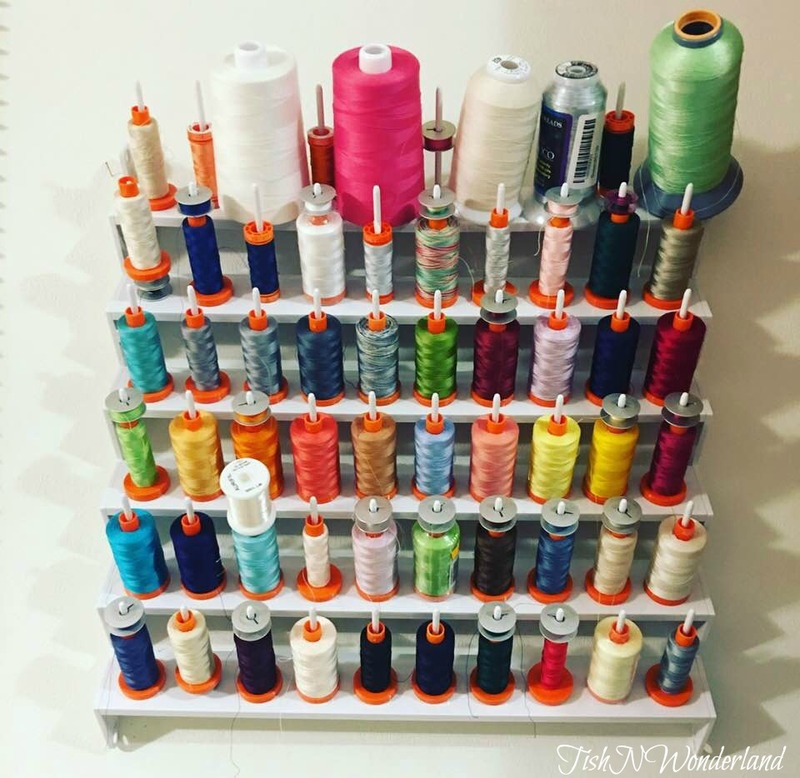 A huge thank you to the folks at Aurifil for allowing me to join their amazing group of thread artists! Let's stitch up a great year and empty some spools of thread. Empty spools equal finished quilts. I am excited to see where your quilting journey has taken you so far, Tish, and I look forward to continuing to watch you grow. 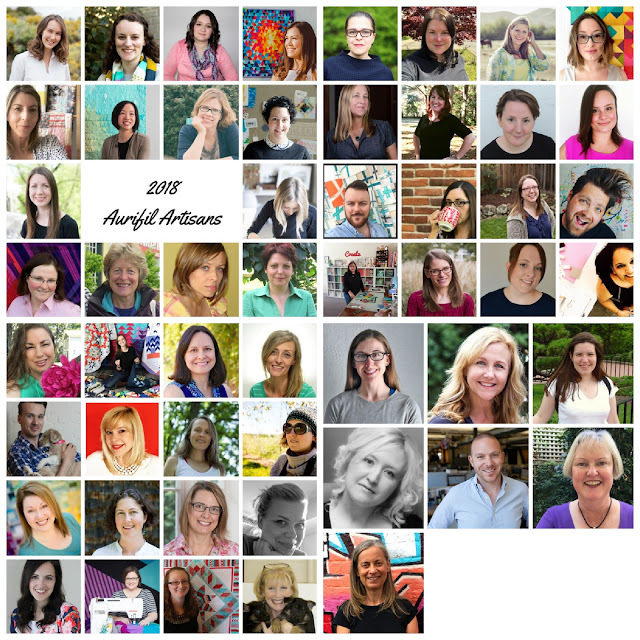 Congratulations on being an Aurifil Artisan! So hard to believe that at one time you actually said that because you were scared of quilting. Maybe there's hope for me yet! I look forward to your posts throughout the year as you work with Aurifil. Congrats! Congrats on your status as an Auriful Artisan. The thread holder, what a great way to have them so handy, and with spools (bobbins) too. I can see your quilting will leap forward, and we will see the colours you use as they really do enhance each quilt. Congratulations! It's been fun watching your quilting evolution! I look forward to more. The heartiest congratulations! Big! Really big!! Tish, it is so fun to hear you say how you've fallen in love with quilting. I'm still quilting on my DSM but am very much interested in moving up to a mid-arm like you did. I love seeing all the quilty goodness of things you've quilted. Do you use the same batting all of the time? Or do you sometimes use a double layer? This is awesome Tish. You are an amazing quilter. Maybe you can slowly teach me how to become like you. Congratulations Tish! 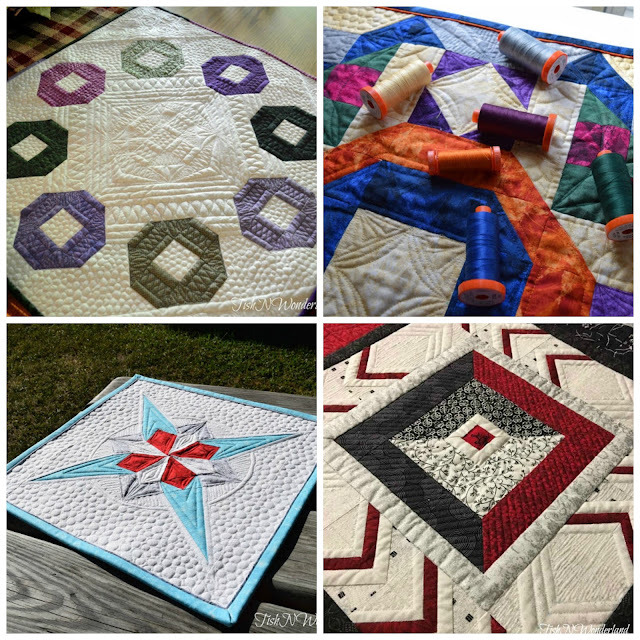 Good to see how much your quilting has involved; your quilts are beautiful. Congratulations on making it onto this list! I've known you really were hoping for it. 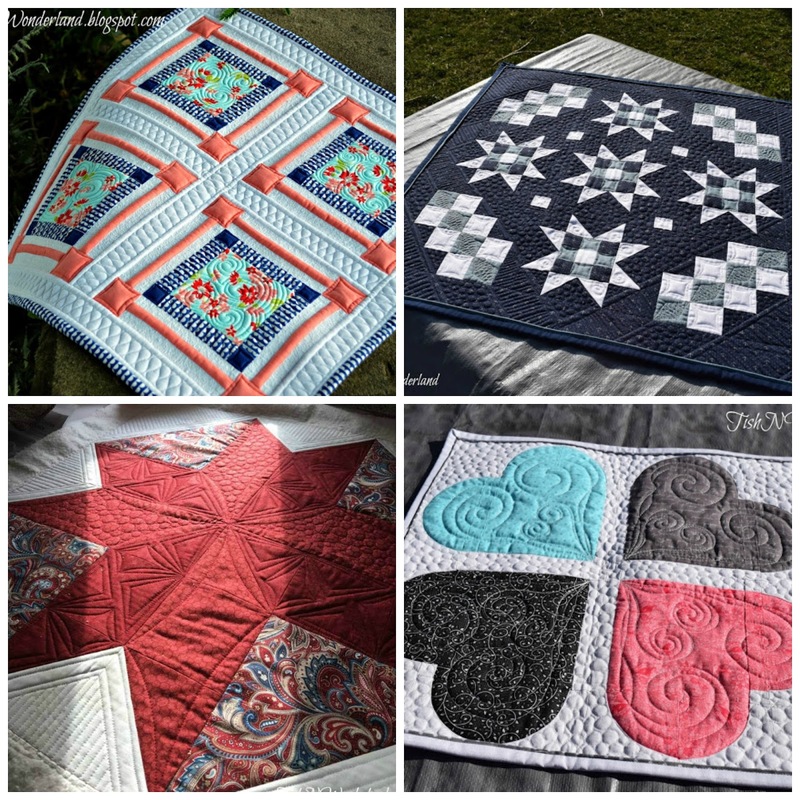 Your quilting work on your pictured quilts is fabulous!! You are do very good work. I look forward to seeing, reading about, and learning more from your work. I was so happy when I saw you in the line up! Congratulations! You always do amazing and inspiring quilting...I'm always in awe! I love hearing about your quilt journey and I, too, am ready to take the time and focus more on my quilting. For me, quilting has been more of a means to an end, finishing a project. I come from the old school of enough is enough and rarely do a ton of quilting - but I am making a tiny challenge for me that I do more or something different with each new project. 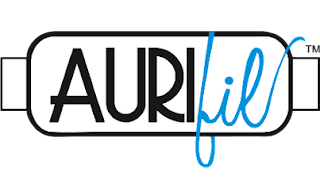 I am sure you will enjoy this experience with Aurifil. Congratulations...I am green with envy...but you deserve it....you've really honed your quilting skills. You took to quilting like a fish to water! 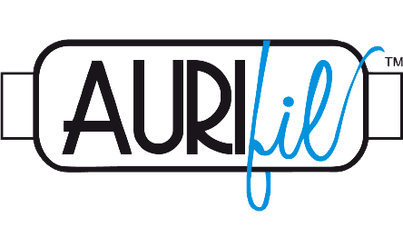 No surprise that Aurifil recognizes you’re special! What a wonderful post. I am open and willing to be brought over to the thread side, and watch/read/listen to your longarm adventure. You inspire me and motivate me all the time with your wonderful quilting, and to think that you actually said you were only going to be a piecer amazes me. YOU said that?!! Step back and look how far you've come . . . and now you're a thread ambassador. COOOOOOOL. Congratulations Tish! You've been doing a marvellous job with your quilting and I've noticed you maneuvering yourself into position for this for a while. Nice goal setting! Congrats on becoming an Artisan! Your quilting is wonderful and I am excited to see what you make in the upcoming year!